In teaching, I wanted to be clear about my objectives. Write it on the board, "Students will be able to..." Let them know what our end goal was. No need for mysteries or secret reveals. This is what we want to learn. What do you hope your children will learn from you? In the list of 11 questions that she asked, it was the one that took me the longest to answer. The question made me reflect upon my thoughts on sharing my parenting objectives. 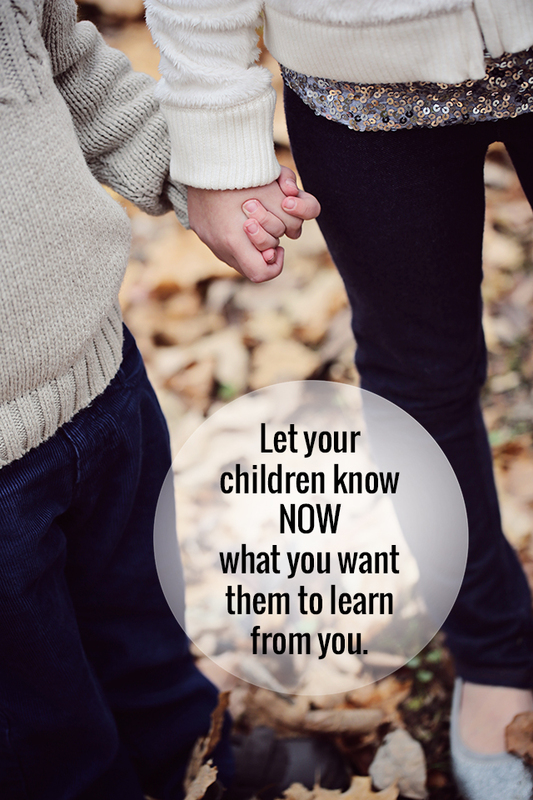 Do my children know what I want them to learn? Do I know what I want them to learn? What is it again? Why am I keeping it a secret to be uncovered at a later point? The question is as deep as it is simple. The whole cycle of parenting involves the activity of what we want our children to learn from us. Our ideals, our beliefs, our dreams become a part of their upbringing. These things "rub off" in our interactions. Are there other areas and lessons that I want my children to learn that might not come up so naturally? My husband and I created a family mission statement late one night when my second daughter was an infant. During one of our innumerable sleepless nights with C, we felt like we were veering off course, or, at least, meandering a bit more in our parenting than we wanted. 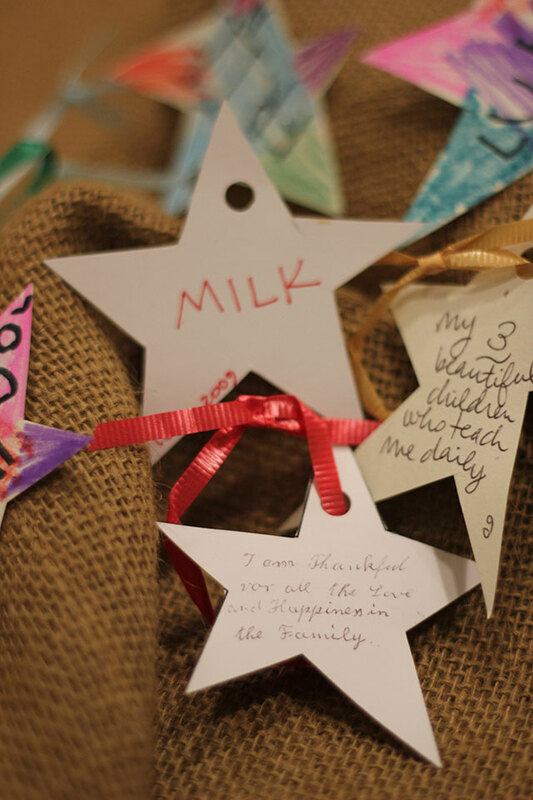 We wrote out these simple statements to remind ourselves of these goals as we changed diapers and soothed teething cries. I hope my children learn that they are always loved by us, their parents, and by a generous God. I hope they learn to go after their passion and to work consistently to point that passion towards the greater Good. I hope they learn that tenacity and enthusiasm can accomplish almost everything you need. I hope they learn to laugh at themselves (a lot) and help other people do the same. And now I'm feeling challenged to revisit our original statement or post this new one for my children to read. And to remind me, everyday. What do you think? 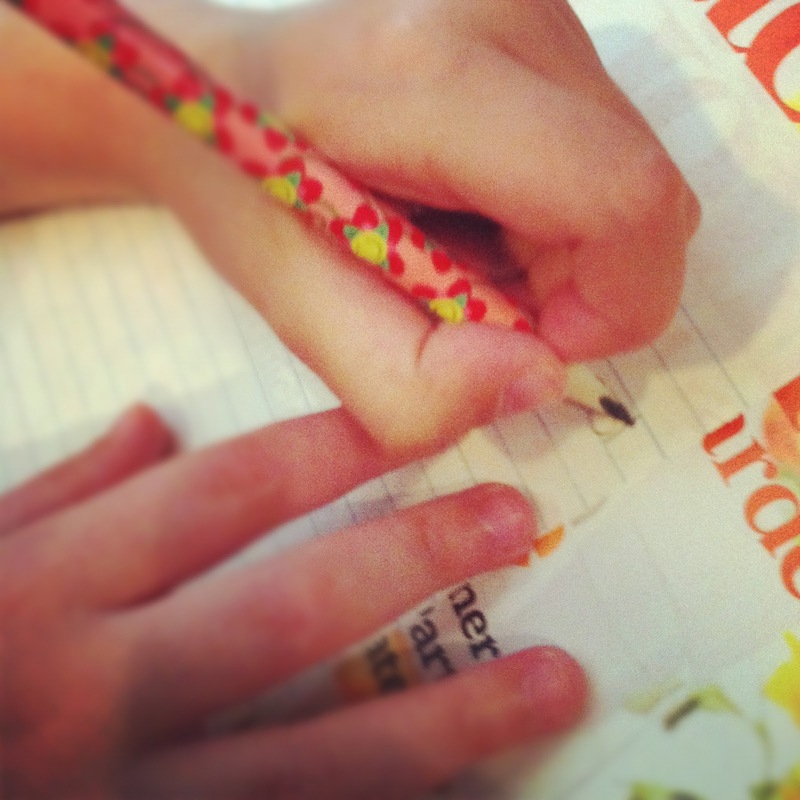 How do you let your children know what is most important? It's about that time to celebrate and relax with the opening weekend of summer: Memorial Day! Whether you're spending the holiday with oodles of family and friends or kicking back for a low-key day at home, I've found some of fabulous activities to enjoy the outdoors and togetherness. 1. Scavenger Hunts are the best! And this one by Play Dr. Mom combines the alphabet and searching, challenging young players to bring items from the outdoors to match up with as many letters as they can find. 2. Looking for a fast DIY for your backyard? Grab a dollar store shower curtain and some painters tape and make a jumbo tic tac toe board. Colorful frisbees make great markers, too! Check out how A Turtle's Life for Me put it all together. 3. Bucket toss is a classic in any arrangement. Pull out the rainbow hues and arrange at a close distance, in a triangle, or far apart to challenge the entire family. Apply numbers to buckets like they've done over on Gets Bored Easily to add another level to the toss game. 4. If your Memorial Day will bring high temps, cool off with some water balloon pinatas like these. Pool noodles make fun bats, too! 5. The poppy is a symbol of remembrance and is often linked to Memorial Day. These lovely flowers were created in a few simple steps - make these together for the holiday! Check out Bar's poppy project over on Handmade Charlotte. What does your holiday bring? Are you ready to welcome in summer? Satisfaction is a funny thing (keeping it clean here, friends). I am rarely content. There's always something I want to do, or something I don't want to do, or something I wished I hadn't done. I'm a pretty passionate, driven kind of person. Except for one day of the year. And that is my birthday. Today is my birthday. And today I allow all the memories of joy flood my interior space. It's a day of virtual scrapbook flipping, remembering all of the people and events that have brought me to this day. And likely, if you're reading this, you're involved in one of those memories. Even if we haven't had the pleasure of face-to-face meeting or even engaging in witty banter on social media, I'm thinking about you today and grateful that you take the time to click over to this space to see what's going on. Your clicks, your reading, and your encouragement have given me the trust that this space can flourish into something I really want it to be - a piece of heaven and a piece of me. A very hard lesson for me to learn, but I have re-learned it again and again in my decades is to be grateful. A great saint once said, "Problems, too, have their purpose. Be grateful for them." Sometimes, most times, I hate conflict. I no longer shy away from it, but I still detest it. And what I'm oh so, so, so slowly learning is that I learn in conflict. I grow in a challenge. Even when I screw up big, life goes on. Might as well be grateful. I live in a world and in a time when anything can happen. When seen from a negative angle, this is terrifying, but when seen from a level perspective, this is pretty exhilarating. I laugh when I think back to my little girl dreams of being a ballerina (I took one ballet class when I was 6) and being an artist. My dreams are so much bigger now, even more fantastical perhaps, but many of them are coming true. Take for example this space. Pars Caeli has given me friendships with very talented and encouraging people and given me professional opportunities that I didn't even imagine. I have moments - maybe you do, too - where I'm physically struck by how good my life is. I had one last week, walking in from the garage, with the smell of fresh herbs in my hands. I was struck and fell back just slightly. No one around me likely noticed. We'd just returned from the nursery, where we went as a family, to purchase our future garden. My children come alive around plants and flowers, and they were sniffing their way around the place, running down the aisles of color, and making up songs to celebrate the joys of summer on its way. I watched my husband carefully peruse each vegetable, considering which could handle our lack of open sunshine in the backyard now that the trees we've planted are so tall and lovely. I realized that I am living the dream that I had not fully formulated as a little girl. And I am so grateful. Lovely people have asked me what sort of special something I'm doing for my birthday. I'm headed into work, taking a break to go to the orthodontist with C, and then heading into three hours of dress rehearsal for my daughters' ballet performance. And, you know what? I'm just delighted. Because this is my "normal," and this is my dream. And I am completely satisfied. Happy April! Bring on those showers and flowers. Our family is in celebration mode today for my hubs whose birthday is today and who has happily handled April Fools jokes his whole life. He's such a good sport. Happy birthday, my love! April 1 brings us the silly, the ridiculous, and the over-the-top - it's the perfect kind of day to have some fun. And it's not too late to do these easy peasy jokes on your kids. 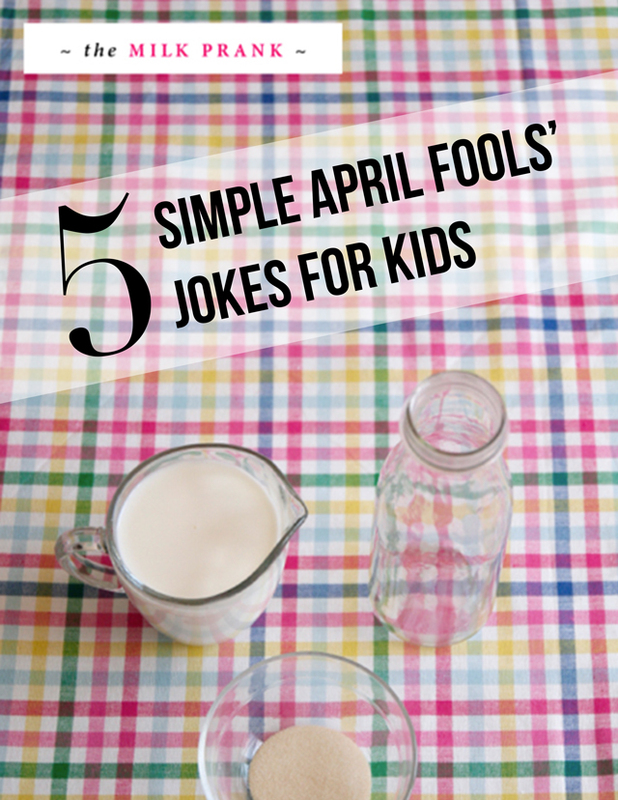 I love the elaborate and extended pranks, but for my kiddos, a simple introduction to the idea of April Fools is called for. 1. I'm a little biased, but I think Classic Play always has the greatest resources for fun with your kids. And, no doubt, Jen has a great treasure trove of April Fools jokes. I love how she and her children illustrated these quick pranks over a breakfast. 2. Martha Stewart's team crafted some fun ideas with food. 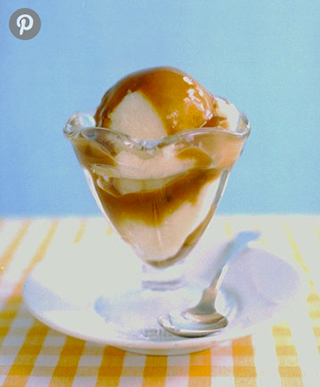 The mashed potato sundae is a classic and one that I think would get my kids. How about yours? 3. Have you done (or been on the receiving end) of the frozen cereal trick. Put the milk in the bowl first, set it in the freezer. Take out and add the cereal. It will leave your little ones dumbfounded, in the best way. The full how-to is found over at Parenting.com. 4. For the youngest set, I think a batch of freshly baked brown E's is a great way to go. Your child will be glad to know his/her letters, but sad/laughing that they'll miss out on the chocolate treat. 5. This last one is a great surprise prank that I might do for fun on some other day of the year. Why not put googly eyes on every food in the fridge? It's such a hoot to open the door to sets and sets of eyes staring right back at you! Are you setting up any jokes this April Fools? We're off to set up a silly scavenger hunt for the birthday boy. Here's to a great April! Hi, hello! How are you, friends? I feel like I've been on a silent retreat for a week, and now all I wanna do is gab and give you a hug to tell you how much you've been missed!! Welcome to the new monochromatic Pars Caeli. I'm a girl in love with color so this is going out on limb for me, but I'm hoping this new ste up will allow all the colorful creations and inspirations to pop right off the page and into your life. I have some great fun planned for the coming weeks, and I'm completely grateful you're taking the adventure with me!! Here's the skinny on what's up: for the fall semester (I still live my life according to the academic calendar), I'll continue my three days a week posting - Tuesday, Wednesday, Thursday. A funny thing happened to my waistline over the summer - it expanded! And instead of putting on my freshman 15, I put on my indulgent summer 15, so I'm vowing to use my time away from the blog to animate this body back into motion. Yes, my friends, there's some nutrition, running, and yoga in my future. I don't one regret one s'more or second plate of pancakes - I let myself enjoy the loveliness of food - but now it's time to get back in the groove. Are you feeling it, too? My hair got nine inches shorter with a bit more sass, and you're going to see some of that same busting out around here, too. We're talking weekly projects, new series, fresh collaborations and a whole lot of good time. Ya with me? Are you ready for fall and the amazingness it brings? Check this out for a little bit of inspiration. I'll see you here tomorrow to share our fall bucket list (is yours ready yet? Here's what we dreamed up last autumn). I'd love to hear what you're up to..